White Sparkle Ghost Pearl ® in 25 gram bag. Treats 1 gallon of Sprayable Base Clear for a pearl white car paint. 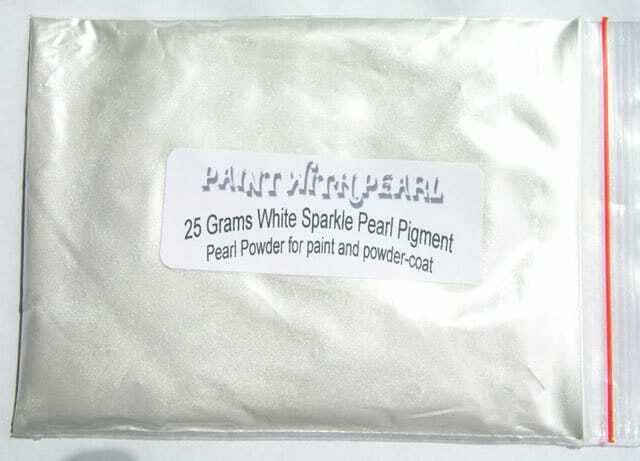 This 25 gram bag of White Sparkle Ghost Pearl powder is a great special effects pigment for adding to clear in custom paint or powder-coating, epoxies, resins, glycerin, polishes or other applications. These look great over multiple different colors.and mix into any clear base, blender or binder. White Sparkle ghost pearl is guaranteed to mix well with any clear paints or tinted candy paints. This has a temperature threshold of about 1600 degrees fahrenheit. 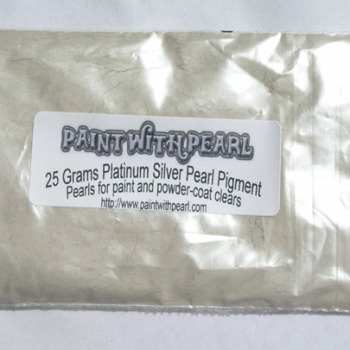 Pearl is a very fine powder and will spray well through airbrushes, powder guns, and HVLP paint guns. It is very light and stays well mixed in paint without settling too fast in your gun. This can make great tinted clears for light to heavy effects (it’s your choice). One 25 gram bag of White Sparkle Ghost Pearl treats a gallon of clear. Our ghost pearls are what custom painters use to create those beautiful pearlescent effects. 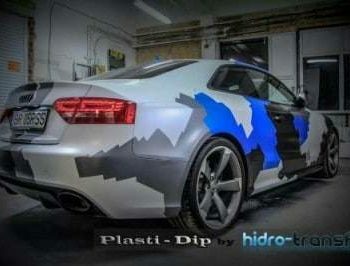 These are on many custom paint and even factory paint jobs. Newer cars and motorcycles can be seen with ghost pearl effects done in the factory including The Lamborghini orange paint with beautiful gold pearl . We see this at auto shows all the time. 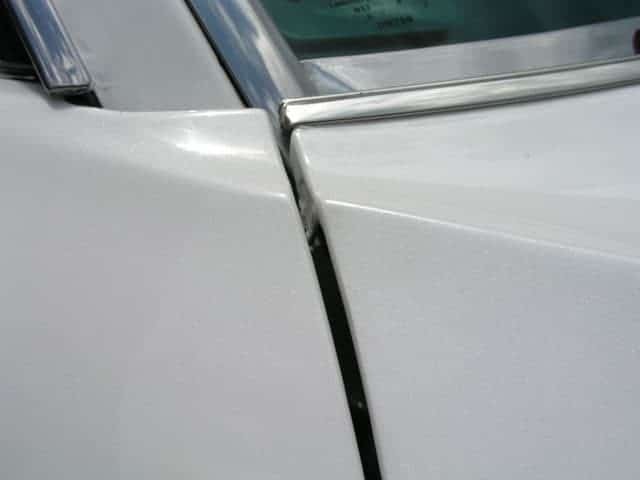 Simpler pearlescent white paints that we see on new Cadillacs or Infiniti cars, which can be achieved with a simple silver ghost pearl or gold ghost pearl applied over a white base coat. Turning a two-stage paint job into a three-stage paint job is the basic step in creating a quality pearl white car paint. Super cool on white, orange, red, green, and many other colors! White Sparkle Ghost Pearl Works in Paint, Powder Coating, dip or other coatings, Concrete Sealer, Leather Paint and polish. These also work in Furniture Oils, Faux Finish Glaze, Pottery Glaze, Fiberglass Gelcoat, epoxies, resins, glycerin, polishes and plastics manufacturing, and much much more. Commonly used in hundreds of industries to create brilliant pearlescent or iridescent effects to many different types of coatings. This White Sparkle (shimmer) ghost paint pigment works in a variety of clears, therefore they are not limited to custom auto paint. These are mixed into screen printing ink, nail polish, leather and vinyl finishes, concrete sealer, gel coat, or faux finish and create metallic custom effects almost anywhere you choose. 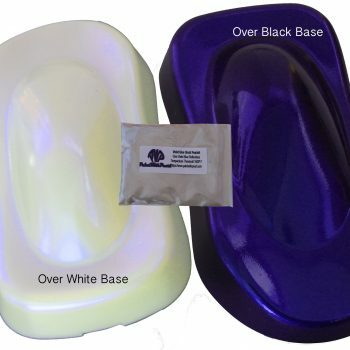 Make your own pearl white car paint. We have seen our Ghost pearl paint pigment used in many industries, including powder coating, plastic manufacturing, custom airbrush art, and gel coating. They work just as well for beginners as they do for professionals. One common mistake that beginners make is that they buy our candy pearls when they want to create a paint that changes in the sun, or as we call it, a “ghost” pearl paint job. These candies create a semi opaque paint that will alter your base, so please keep that in mind! Remember to visit our tips pages for other useful information. We at Paint With Pearl appreciate all of our customers who take the time to send us pictures and feedback on all of our products. Our Candy Pearls, Metal Flakes, True Chameleon pigments, Thermochromics, Glow In The Darks and all other paint pigments are truly custom paints and can be used in almost any application, therefore the options are endless! Photos, Videos and testimonials are a great way to show off the capabilities of our additives. If you find the opportunity, send us some great pics and a small testimonial about what you did with our products. We will send you a gift card for the website. We love to show off the work that our wonderful customers are doing. Contact us and send us your work! Check out some of our products on Amazon Prime! We are now accepting payment through Amazon! Our White Sparkle Ghost Pearl come in 25 Gram quantities. They are Transparent Mica Particles With Color Reflections, which give your project an iridescent glow.